Both companies reached a collaboration agreement to offer a unique commercial service in the market. In this way, both companies merge their value-added knowledge based on drone and radar technologies. Castelldefels (Barcelona), 12th May of 2017 – HEMAV and DARES, two of the Spanish technological companies with more growth in the last few years, have decided to share knowledge in order to offer transversal and complementary services that provide an important added value to their respective customers. The agreement has been signed at the Baix Llobregat UPC Campus, where both companies have their headquarters. On this line, HEMAV will offer its experience in industrial solutions design and commercialization, obtained thanks to its technical processing capacity of the information acquired using drone technology (RPAS). 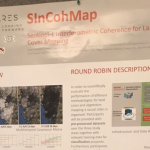 On the other side, DARES provides terrain deformation measurements using radar satellite images, with a long career in the mining, gas and, petroleum and infrastructure industry. 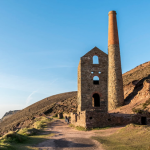 The combined dron and satellite product is capable to provide a high level of detail for any inspection and monitoring application in industrial environments at any scale. With the satellites a macro view is offered so that a much more detailed and complete auscultation can be performed using RPAS technology, combining different types of sensors to give more information. Alex Gomar, HEMAV founder, has assessed that ‘It is a unique offer in the market in which customers from both companies will find a gain, thanks to the transversal and complementary services that we will able to provide them with’. From his side, Dr. Javier Duro, DARES’ CEO, has added that ‘we are pleased to be joining forces with HEMAV, since both companies share the same philosophy and our intentions are to give the maximum value and services to our customers’. Both companies are in the first incubation center the ESA established in Spain, specifically in the UPC Baix Llobregat Campus, managed by Barcelona Activa. 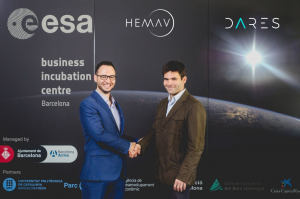 HEMAV was the first company to settle in the Business Incubation Centre (BIC) Barcelona in 2012 and steadily, the BIC has been growing until becoming a national and international reference space in new technology companies. DARES TECHNOLOGY (www.dares.tech) provides ground motion measurements and mapping products using radar satellite images, mainly in the mining, gas and petroleum industry, as well as infrastructure.. DARES currently has a first level technical team specialized in the different areas related to radar technology. At the commercial level, DARES has representation in different continents since its clients are multinational of first level of the whole world. HEMAV is a company that designs and sells solutions of great added value to economical activities such as the agricultural industry and industrial, audiovisual and topographical inspection thanks to its technical processing ability of the information assembled by drone technology (RPAS). The firm specializes in processing data and images, and is a pioneer in the aeronautical and operative development of the drone technology. 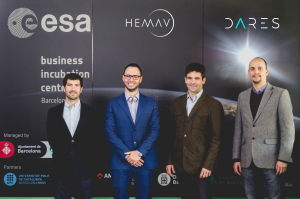 Born in 2012, HEMAV became the first company to settle in the incubation center the ESA established in Castelldefels. Nowadays, it provides employment for more than 90 multidisciplinary workers in his headquarters in Catalonia and Madrid.